Our family room and kitchen are 95% completed after our home flood last August. I’m so excited! 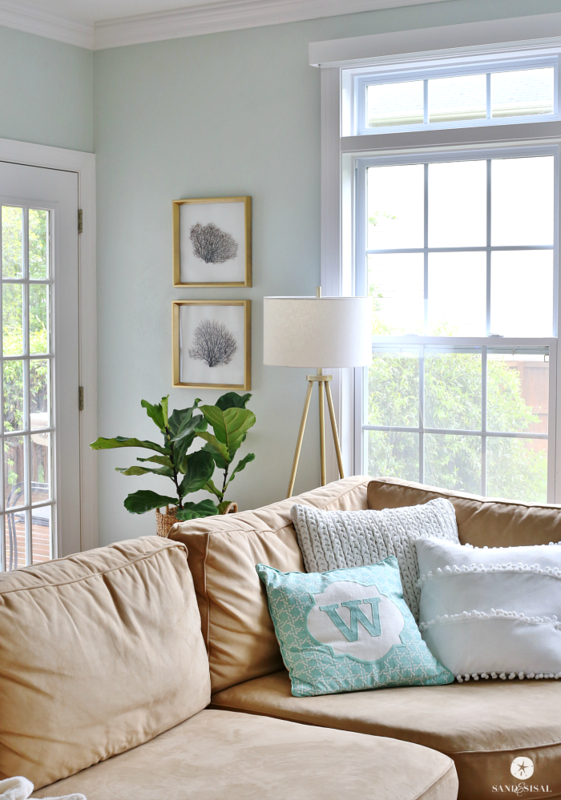 Because we redesigned so much of the room and added built-in bookcases, the room is needing a lot of accessories and art. In lieu of spending a ton of money on new items, I decided to shop my own house. 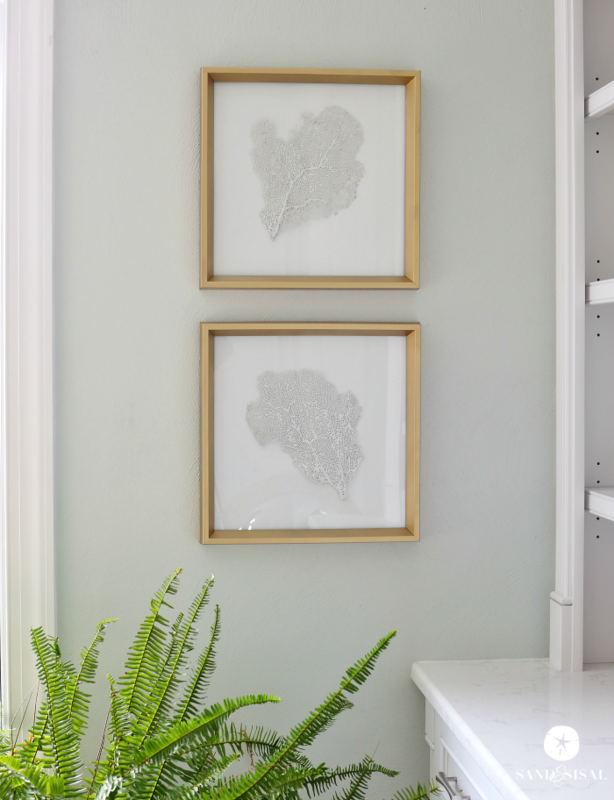 My DIY Sea Fan Art from 2013 had faded quite a bit and needed a bit of a glam makeover! 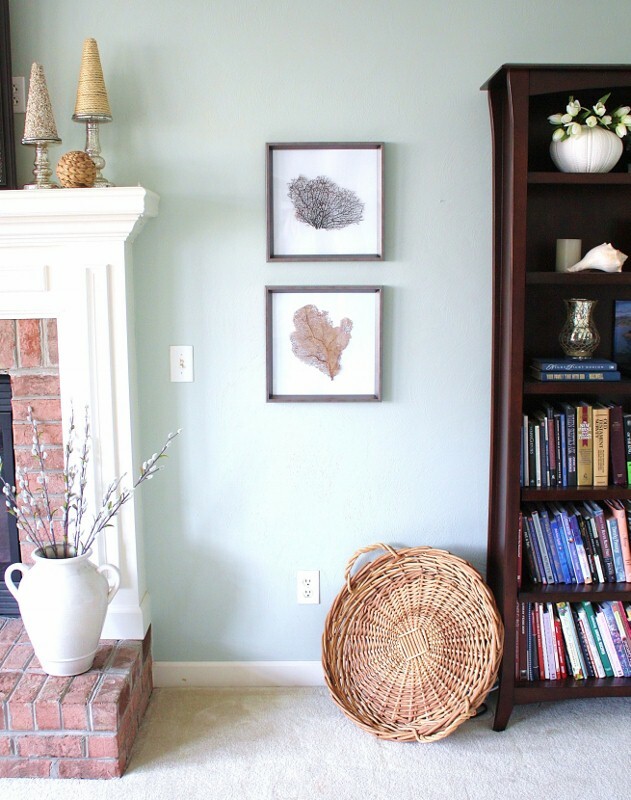 Today I’ll show you how you can save in insane amount of money and make your own DIY Framed Sea Fans. Here’s a look at the old sea fan art. It had dark silver frames which was not what I wanted in our family room anymore. 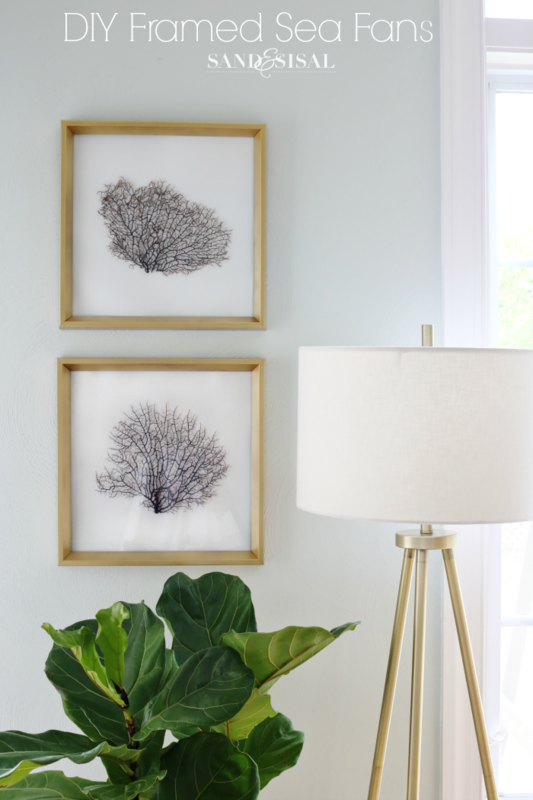 For my step by step tutorial on how to prepare the sea fans for framing, click on this post: Sea Fan Art. Now I used real sea fans for this project. You can find them online or at some stores that sell coastal items. Here is an affliate link to Amazon where you can buy inexpensive sea fans. They will need to be prepared before framing so be sure to check out my originial post (listed above) on how to frame sea fans. See how much the coral red sea fan had faded? That was it’s natural color. Now it looks like a boring shade of beige. All I did to update the look of the frames was to disassemble the art and spray paint the frames with metallic gold spray paint. Then I painted the faded pinky-beige sea fan with white paint in an egg shell sheen. You can use primer, spray paint, or acrylic paint. Whatever you have on hand is fine. Paint both the front and back of the sea fan and allow to dry well. Oh they look so much better now! 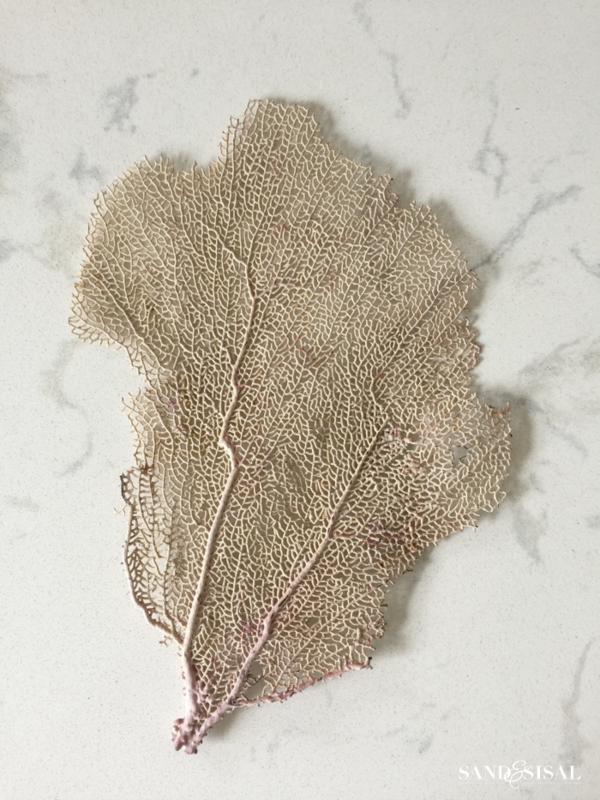 I was nervous that the white on white sea fan would not show up enough but they do and the delicate and intricate texture is still visible. Now let’s take a look at the black sea fans. They are my favorites! 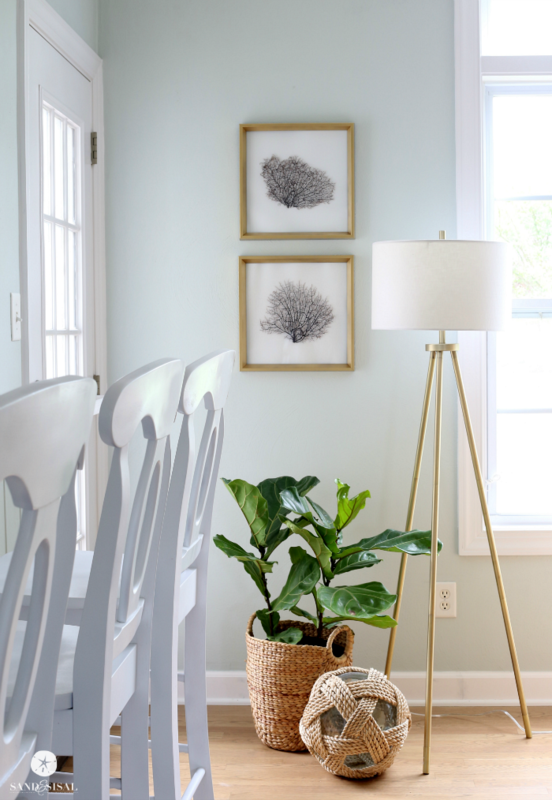 The gold tripod lamp is a new find from Target too. 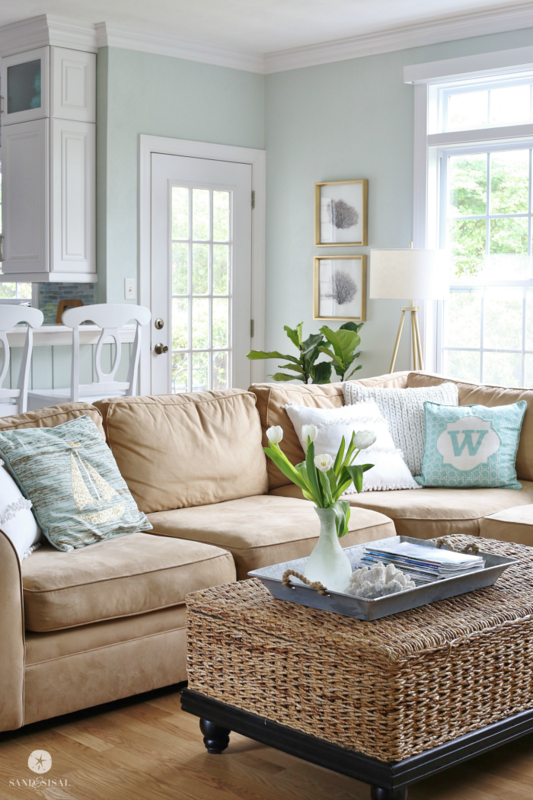 Ready for a peek at the family room? I’ll share the entire family room in the next few weeks. I’m still putting on the finishing touches. And here’s a peek at one of the built-in bookcases. I’m in love with it all! 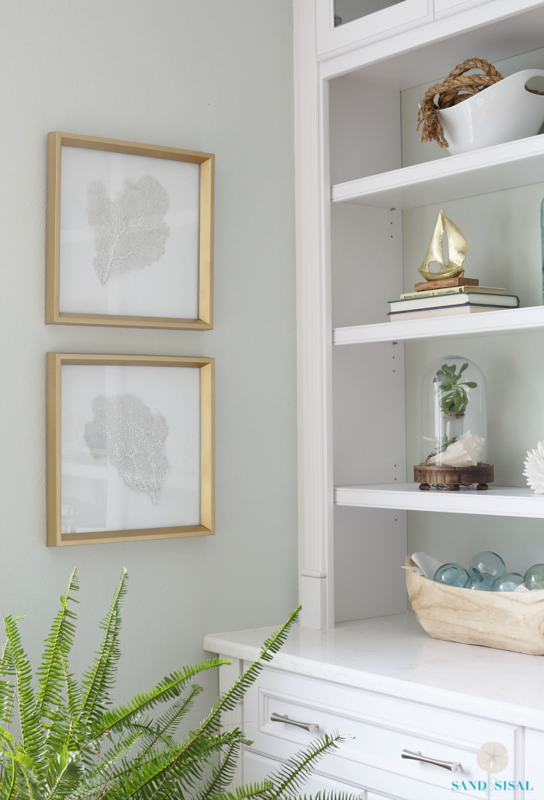 I hope you try making some DIY Framed Sea Fans for yourself! Hi Kim, Very pretty. A few years ago I sold dyed sea fans on Etsy until there was a ban imposed making it illegal to ship fans to the U.S. There are still companies with stock but I have found the remaining supply is very poor quality. I love the look and so glad I had saved a few fans for our home. Oh wow, I had no idea Sherry. I bought mine so many years ago. Thanks for the heads up! I love all your updates!! Your home is just like few of my neighbors! We’re around the corner from you and it gives me hope for myself!! Would you be able to share who built your bookcase units? I love them!! Thanks! Thank you Melissa! Dave’s Cabinets (South Battlefield) built them. Most of the homes in our hood already have built-ins but ours was lacking. Wow Kim it all looks so gorgeous already! 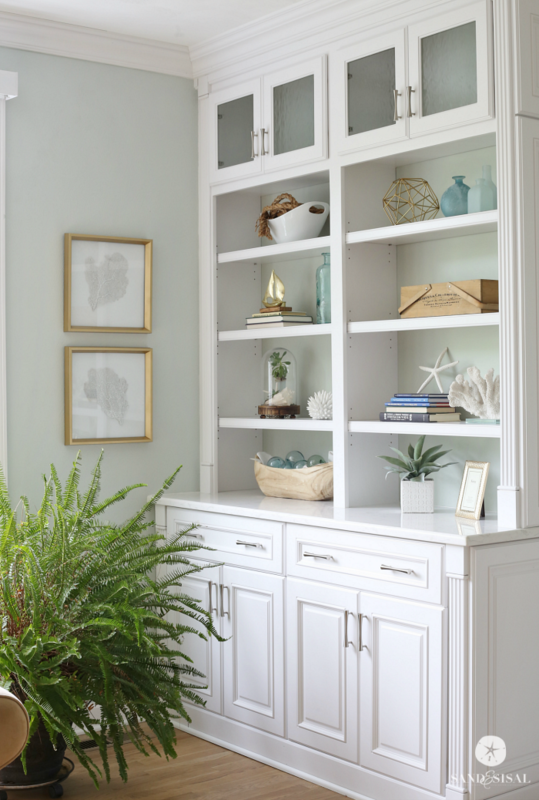 LOVE the built-ins and that wall color! Hi Donna! 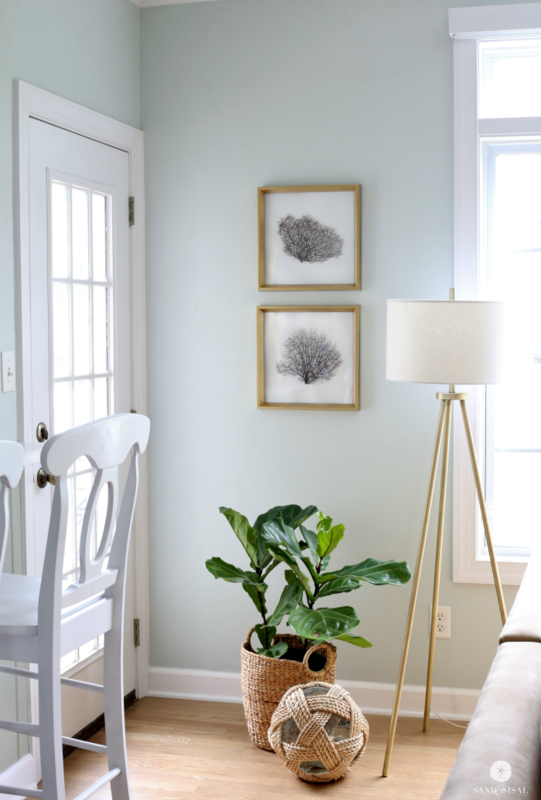 The wall color is Sea Salt by Sherwin Williams.